IISD Reporting Services (IISD RS) has produced daily web coverage and a summary report from these meetings. To download our reports, click the HTML or PDF icons below. Objectives for this forum included: endorsing the “Vision Three Zeros” (Zero Congestion, Zero Pollution, and Zero Accidents) as a guiding principle for discussions on next generation transport systems; improving understanding on the role of EST in realizing the Rio+20 outcomes as documented in “The Future We Want”; building consensus on the need for more climate resilient transport in Asia; working toward development of a regional agreement on green freight in Asia; and evaluation of initiatives, achievements, and best practices in addressing the Goals under the Bangkok 2020 Declaration. Specific topics also included regional connectivity, public transport, non-motorized transport, railways, financing needs, and intelligent transport systems. One of a series of consultation meetings being held in 2013, the Global Consultation utilized the existing Regional EST Forum in Asia to engage ministries of environment, health, and transport in the discussion on how sustainable transport can contribute to sustainable development and to consider possible development of a Sustainable Development Goals for Transport and associated targets and indicators. Attended by over 170 participants, including delegates from 24 countries in the Asia-Pacific region, the integrated events were co-organized by: Ministry of Transportation Government of Indonesia, Ministry of the Environment Government of Japan, and UN Centre for Regional Development. 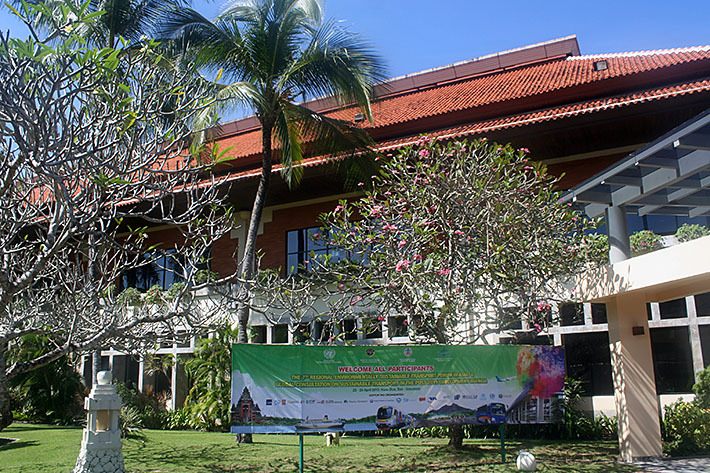 On Tuesday, the 7th Regional Environmentally Sustainable Transport (EST) Forum in Asia and Global Consultation on Sustainable Transport in the Post-2015 Development Agenda opened in Nusa Dua at the Bali International Conference Centre, Westin Resort Nusa Dua. On behalf of Made Mangku Pastika, Governor of Bali, Dewa Punia Asa, Head of Transportation, Bali Province, welcomed delegates and highlighted the need for participants to commit to the proposed guiding principles, "Vision Three Zeros" (zero congestion, zero pollution and zero accidents). Delegates heard opening remarks from Chikako Takase, Director, UNCRD, Eiji Hiraoka, Councillor, Minister’s Secretariat, Ministry of the Environment, Japan, Balthasar Kambuaya, Minister of Environment, Indonesia, and E.E. Mangindaan, Minister of Transportation, Indonesia. Thomas Hamlin, Technical Adviser, UN Department of Economic and Social Affairs, delivered a special address from UN Secretary-General Ban Ki-moon. The keynote address by Michael Replogle, Institute for Transportation and Development Policy, Washington D.C., outlined the concept and history behind Vision Three Zeros. He said that sustainable transport will require focus on the means of implementation and must support inclusive prosperity. He called on participants to adopt the Vision to effect major changes in the transport sector. Delegates attended six plenary sessions with presentations and panel discussions. The two morning sessions covered: EST in the context of Rio+20 outcomes; and regional connectivity. In the afternoon, four plenary sessions addressed: transport mode/issues in public transport; the potential for EST measures to help build resilient communities; a framework for regional agreement on green freight in Asia; and recent developments in non-motorized transport. On Wednesday morning, participants heard a keynote address by Masashi Mori, Mayor of Toyama City, Japan, on "Building 21st Century Cities - Toyama’s Unique Compact City Management Strategy - Creating a Compact City by Re-imagining and Restructuring Public Transportation." This was followed by panels on: Railways in EST Toward Post Rio+20 Development; Financing Needs for Next Generation Sustainable Transport Systems for the 21st Century; and Institutional Arrangements in Realizing Next Generation Sustainable Transport Systems. In the afternoon, participants heard a panel on Intelligent Transport Systems: A Vision of 21st Century Cities. Country delegates then convened in four parallel breakout sessions to present their country initiatives and achievements against the Bangkok 2020 Declaration. Reports of each breakout group were presented to plenary, after which multilateral development banks facilitated three parallel round tables of country delegates on financing sustainable transport in response to the post Rio+20 commitments of the MDBs. Plenary then resumed for reports by the rapporteurs of these round tables. On Thursday morning, participants began considering how the Forum could contribute to sustainable development, including the possible development of a Sustainable Development Goal (SDG) for transport and associated targets and indicators. Thomas Hamlin, DSD/UN-DESA, opened the meeting. Wendy Aritenang, Ministry of Transportation, Indonesia, expressed his country’s commitment to sustainable transport and the SDGs. Michael Replogle, ITDP, reflected on past processes, such as Agenda 21 and the Johannesburg Plan of Implementation, which built a foundation for further discussions on EST. Cornie Huizenga, SLoCaT, stressed the relevance of EST for achieving sustainable development, urging that it be addressed in one of the upcoming SDGs. Heather Allen, Transport Research Board, chaired a panel addressing the relevance and consistency of sustainable transport with national policies and plans. Three breakout groups, facilitated by Cornie Huizenga, Heather Allen, and Michael Replogle, considered the merits of a sustainable transport SDG. In the afternoon, the facilitators reported back on the morning’s discussion, noting general agreement on the value of an SDG on transport, while recognizing the need for differentiated approaches, capacity building, and the potential role of the EST forum for promoting sustainable transport in the international arena. Delegates then considered the draft "Bali Declaration on Vision Three Zeros for Next Generation Transport Systems: Zero Congestion, Zero Pollution, and Zero Accidents." Discussion focused on whether "accidents" or “fatalities” was preferable wording and text related to financial assistance in advancing sustainable transport. Both issues were resolved during an informal consultation and the delegates adopted the Bali Declaration. Rohana Kumara Dissanayake, Deputy Minister, Ministry of Transportation, Sri Lanka, announced that Sri Lanka will host the 8th Regional EST in October 2014 in concert with the Better Air Quality Conference. Closing remarks were offered by Bambang Susantono, Vice Minister of Transportation, Indonesia, Satoru Morishita, Ministry of Environment, Japan, and Chikako Takase, Director, UNCRD. After a dinner hosted by the Ministry of Transportation, Indonesia, participants enjoyed traditional Indonesian dance and music and observed the formal passing of “bamboo” symbolizing the transfer of hosting the next meeting from Indonesia to Sri Lanka. Delegates huddled to come to consensus on wording of the Bali Declaration on Vision Three Zeros for Next Generation Transport Systems: Zero Congestion, Zero Pollution, and Zero Accidents. Questions about the content of this page? E-mail the Digital Editor.